Today, we offered our first tour offering, a high-end Pampanga food tour brought to you by Our Awesome Planet, Ivan About Town, Old Manila Walks and Manila Boy. Breakfast was at Everybody's Cafe where we had tsokolateng batirul and Imang Salud's ensaymadas, pindang damulag, longganiza among many others. We visited the lantern factory of Rolan Quiambao which was abuzz with activity. Then it was a drive around the San Fernando heritage district before proceeding to the Betis and Bacolor Churches. Lunch was at Claude Tayag's Bale Dutung. We spent four hours eating!!! Our next trip will be different and it's scheduled on December 15 with a special treat in the evening, the Giant Lantern Festival! On December 15, let's journey to the Central Luzon heartland as we immerse ourselves in things Kapampangan! From Baroque to betute, it's a fun-filled day as we poke around and get intimate with the very best of this province's cultural offerings. We'll gawk at the jewel-box of a church in Betis while wading through the half-buried town of Bacolor. 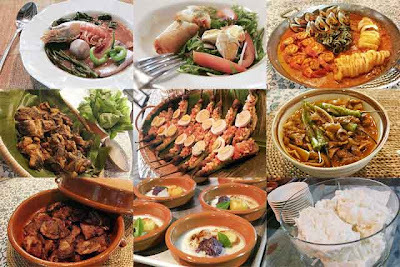 We'll stuff ourselves silly with the best Kapampangan fare by one of the country's best known Pampango chefs! To it cap-off, we'll have front-row view of the most dazzling display of Kapampangan artistry - the Giant Lantern Festival of San Fernando! A tour screaming with Pampanga's pride! There are just 35 slots so book now by e-mailing info@ivanhenares.com. The Tour Experience: Betis Church, Bacolor Church, Claude Tayag's Bale Dutung, Pampanga Pasalubong Shops, Ligligan Parul (Giant Lantern Festival) in San Fernando, and featuring our own version of the bento box for dinner: the Cabalento Box!!! Would have loved to be part of this "show-off" and wd hv booked 2 slots if not for the date. Will be arriving Manila 16th Dec. Sayang! Have fun and let us know what we would have missed! No frogs on the menu? Well Rowi is going home one day to late and alas I am on the plane heading back to Belgium for some Christmas holidays that day. Sayang! Sound like a very attractive tour! There are! The bento box we will be giving out for dinner will have a serving of betute if the participant wants. Hehe! Partner! I have always missed this Giant Lantern Parade and I don't want to miss this now. However, I have bazaars until the 17th. Am I too late?